Track & Field, Bowling, Floor Hockey, and Bocce. All training, equipment, and competitions are provided at no cost to the athletes or their families. All skill levels, from beginners to advanced athletes, are accepted in all sports. Attached is a list of upcoming sports and their corresponding schedules. An athlete must be at least eight years old and be identified by an agency or professional as having an intellectual disability. Each athlete must have a current Application for Participation (PDF File) on file with the program, to be eligible to train and compete. This form, also called the medical form, must be signed by a physician and is valid for three years. Participation in Special Olympics is free for every athlete. The benefits to the athletes go beyond the sports. The athletes have opportunities to make new friends, enjoy new experiences, develop confidence and know the pride of accomplishment. Delina Rodrigues (front) looks on as Maureen Foster, manager of Special Olympics of Carbon County, recognizes her before Palmerton Area School Board on Tuesday. Rodrigues was recently named Special Olympics Female Athlete of the Year. One of Special Olympics of Carbon County's finest has been recognized with quite the distinction. Delina Rodrigues, a freshman at the Carbon Career and Technical Institute, was recently named the Special Olympics Female Athlete of the Year. 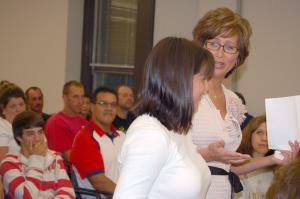 Rodrigues was introduced to the school board on Tuesday by Maureen Foster, manager, Special Olympics of Carbon County. The daughter of Dave and Christine Rodrigues, Delina was selected from over 20,000 athletes participating in Special Olympics Pennsylvania. Foster said Delina, who participates in bowling, track and field and floor hockey, is a "model athlete." Volunteers are always needed to assist the athletes in their programs, Foster said. "Just be a fan; join us at one of our special events," Foster said. "If one person can make a difference, imagine what we can all do." Foster then thanked the district for allowing the group to utilize the tennis courts at the high school for boccie, the latest sport to be offered. Superintendent Carol Boyce told Rodrigues the board had a certificate of recognition for her. Rodrigues received her award in Harrisburg as part of the Annual Leadership Conference Special Olympics conducted earlier this month. 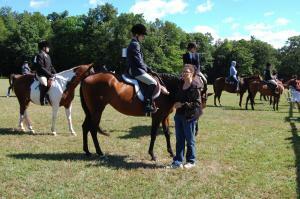 Bridgette Devney waits at the gate on Sassy for class 8, English walk-trot pleasure 13-18 year olds. Appaloosas and paints, chestnuts and bays - a variety of colors filled the show grounds of the Getz Farm in Albrightsville on September 5. Charles and Carol Getz host two shows every year and this one was to benefit Special Olympics. It was cool and breezy, which beats hot weather any day for a horseshow, and cool and breezy is what the Special Olympics show had. "The weather is perfect," said Penny Kleintop, who helped organize the show. County Commissioners William O'Gurek and Charles Getz are co-managers of Special Olympics of Carbon County, ever since 2007 when it was formed. For information about Special Olympics go to www.specialolympicscarboncounty.com. Two riders lost their seats but fortunately no one was hurt. Judge Chick Moyer said that is about average for a show. Moyer is from Fogelsville and used to have the Green Acres Equestrian Center until he semi-retired. Now he only has his own horses. He is certified to judge quarterhorses and snaffle bit, and both showed and judged cutting and reining horses. Moyer said when training a horse the first thing to be done is to put a "stop" on it, he said. It creates a greater level of safety. He was amazed when visiting a ranch out west to meet Carson, 6, who drives cattle and breaks horses. Indoors there was a Chinese auction featuring a Longaberger quilt with a basket design as the central object. It is valued at $400. There were several tables of prizes, and one of desserts. The outside food menu was long and varied. The announcer kept enticing people to the food stand by saying how great things were - and how they really ought to get a ticket for the quilt. Ella Tomala, otherwise known as Ellie the Clown, was painting faces and just being pleasant to the guests. Class 11, the walk, trot pleasure open class, had 16 riders and claimed the record as the largest class. Kleintop said they had approximately 50 horses participating. Her husband, John, was the ring steward for the day. Doc Holiday of Split Rock Resort was the announcer. He thanked all his friends who came to the show, including some who were guests at Split Rock. Joy Holiday sang the national anthem to kick off the event, with Pastor Doug Holtz of St. Paul's Evangelical Lutheran Church giving an invocation. Courtney McCall presented the trophies and ribbons. "It's one of the best turnouts I've seen in a long time - a really good turnout for Special Olympics," said Holiday. A horseshow includes moments of disappointment such as when a child was called for first place and the judge realized a mistake was made in reading the numbers. During the lead line class in which children age seven and under are led around the ring, Holiday said, "This is the next generation of riders right here." The three entries were each given gift bags. It was announced as a three-way tie. A stick horse class was available for everyone who dreamed of owning a horse but did not have one. Holiday said the adults didn't do so well but the kids did. Champions from previous years who were in attendance were acknowledged. When Amanda Van Kirk was the last rider (first place) in the break and out class, she raised her arms and gave a cheer. She was riding Spending Daddy's Money. A bouquet was presented to Delina Rodrigues during the lunch break. She was named the Pennsylvania Special Olympics female Athlete of the Year. Rodrigues participates in bowling, track and field and floor hockey. Her parents are Christine and Dave. Championships went to Courtney Krause, youth high point rider on Signature of Silk. The open high point English rider was Brittany Malinoski on R Show Boy. Alissa Poster earned the youth high point Western championship riding Ragtime Zip. The open high point Western rider was Rebecca Stroup on As Slow As It Gets. Stroup and horse owner Carol Getz donated the prize money to Special Olympics. Emily Mantz was the gymkhana youth high point rider with her horse Just Another Toby. Class sponsors were announced as the classes were called. A number were made as memorials to friends or family members. The largest number was from people wishing the Special Olympians "good luck."